Much as I like Giada de Laurentiis's recipes, I wasn't very enamoured of her book Giada's Family Dinners when I first bought it. Unlike her earlier book Everyday Italian, arranged in chapters according to course which made meal planning a breeze, I had difficulty navigating this cookbook and finding recipes I wanted to make. Joining eat your books changed all of that. It's amazing just how many recipes from this book pop up when I search my cookbooks using ingredients I have on hand as filters. So with chicken, artichokes, lemons and tomatoes in the fridge, for this week's I Heart Cooking Clubs potluck, I abandoned featured chef Nigel Slater to cook with Giada. Grilled Chicken with Gremolata was one of those dishes that had me wondering what I'd been thinking all those times I didn't know what to do with chicken breasts to make them more interesting. I'd made gremolata before, but never thought to use this bright and fresh tasting mixture of chopped herbs (I used parsley and mint), lemon zest and garlic, to top grilled chicken. It was quick and delicious. The Stuffed Artichokes, on the other hand, were a little more labour intensive, though once the artichokes were prepped and cooked, came together rather quickly. 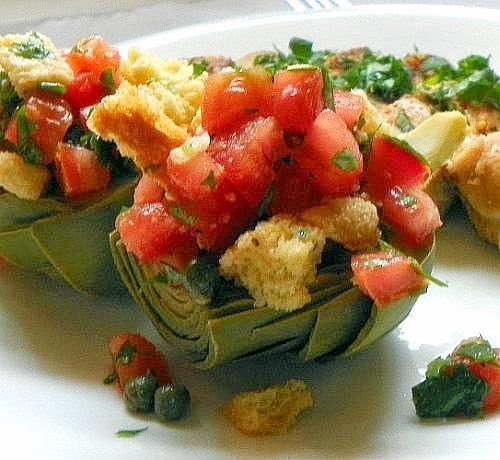 This dish was actually more of a salad than what comes to mind when I think of a stuffed artichoke, with the boiled vegetable acting as a vessel for a zingy mixture of tomatoes, bread cubes, capers and herbs dressed with olive oil and lemon juice. I thought that the bold flavours of the topping overwhelmed the more subtle artichoke, but one of my daughters - whom I suspect has been watching too much MasterChef and Top Chef Canada of late - pointed out that I'd neglected to season them with salt. Guilty! They were still very good and we enjoyed them served at room temperature. I'm glad I didn't give up on this book because every dish I've made from it has been a success and has had that Giada flair: flavourful, often quite elegant yet deceptively simple, and with at least a passing nod to her Italian heritage. Next week I'm going to "veg out" with Nigel for IHCC, but I'll be revisiting Giada and this book soon. My, what pretty artichokes! I am intimidated by this vegetable (?) ... so am extremely impressed that you've brought this recipe to the Potluck! As for that chicken ... basic, but so succulent! Great photos this week! What a beautiful meal! 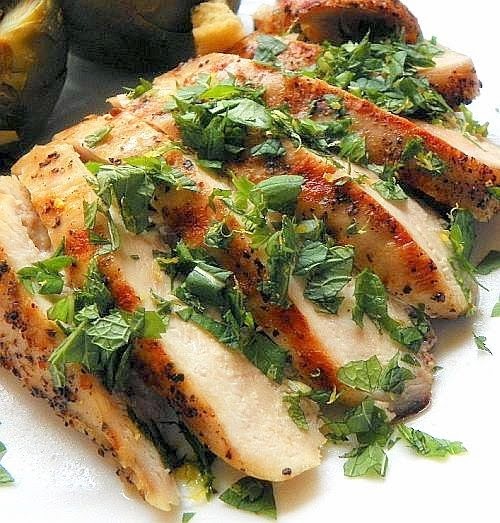 The gremolata sounds really fragrant and refreshing with the herbs, and I can see how they must have added a whole new flavour to the chicken. Delicious! Like Deb I am a fan of gremolata. your dish looks very spring like. We had a mild winter here and strawberry season started early this year, but the rhubarb was late. I favor Giada's style of cooking and love both of these dishes. 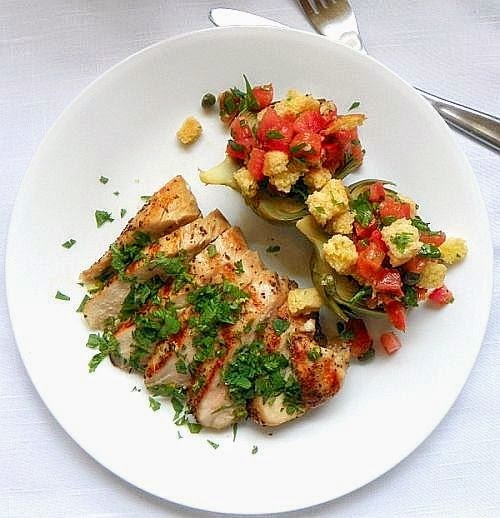 Your chicken breast looks perfectly cooked and the gremolata topping looks so fresh and flavorful. I love that your daughter is offering up her opinions. Shows that she is interested in cooking, which is definitely a good thing! Turkey Chilli - IHCC Weeknight Favourites!